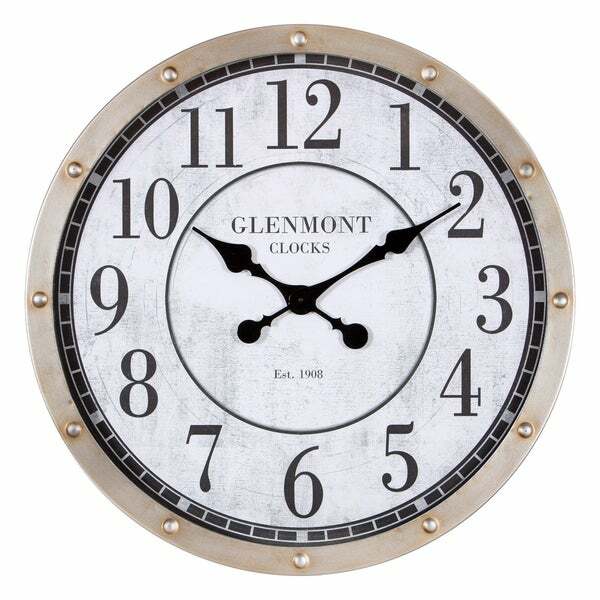 Add a classic touch to you decor with this 24" Glenmont Rustic Port Hole Brushed Silver Metal Round Wall Clock. Inspired by vintage time pieces, this wall clock blends traditional and vintage style seamlessly. Constructed of durable metal in an antique bronze finish, the clock face features an antique white background with distressed standard numbers. Hangs securely to any wall surface with durable hanger on back. Requires one AA battery. Dimensions 24.0 In. X 2.25 In. X 24.0 In. "Does this clock have glass over the face?" Best Clock for Your Bedroom from Overstock.com. Our guides provide customers with information about the best clock for your bedroom.